I was really excited when I heard about this company name Janes they make and have their own hospital gowns that don't look like the typical hospital gowns you would see in the hospital. I will defiantly be using this when we have our third child. Because I didn't care fo the hospital gowns they aren't very soft and doesn't keep you warm at all. With Janes the material is super soft and warm on your skin and all I can say is nothing but great things about this company. Look at this gown isn't it so much prettier then the average gown? I love it and it has so much room for baby to grow. This gown retails for $32 dollars and comes with a cinch sack for just $5 more and you can also have monogramming done for a extra $7. They come in 2 sizes size 1 and size 2. If you are interested in purchasing these gowns check them out Here to ger your own. These gowns are not only good for pregnancy or having a baby. You can take these to the doctor with you for your regular appointments, breastfeeding, and much more. Shhh don't tell I have even used this a a robe to cover up if I was cold ha ha bet you didn't think of that idea. 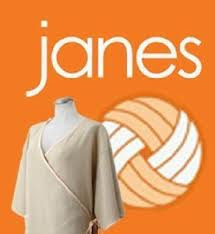 I just love Janes all around and is a great product with endless possibilities!!! Janes patient gowns are constructed of a soft, durable, spa-like waffle weave knit fabric (60% cotton / 40% polyester) designed for comfort and durability. Add the cinch sack to easily take your Jane to your next doctors visit or given as a gift. Please Note: Items with monograms and logos can not be returned unless a name is misspelled or the logo is incorrect. I am not sure if I would remember to carry with me to the doctor. But having to be hospitalized from time to time I would love to have for that. It looks so much better and nicer!